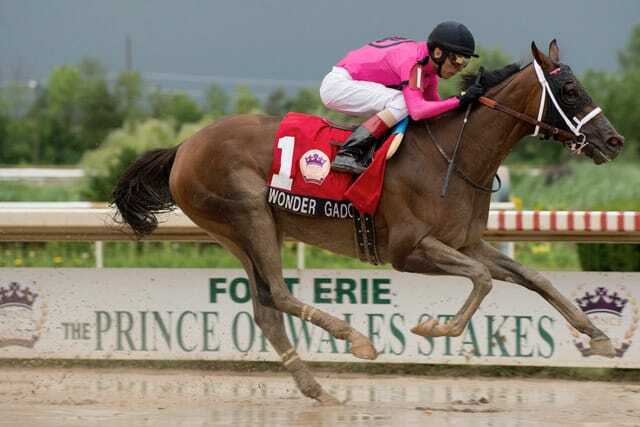 FORT ERIE, ON – Gary Barber’s super-filly Wonder Gadot continued her reign of terror over Canadian-bred horses on Tuesday, taking the lead early and refusing to yield to any of the five boys that dared challenge her in the $400,000 Prince of Wales Stakes at Fort Erie. Breaking sharply from the rail under John Velazquez, Wonder Gadot was briefly met with a challenge from Cooler Mike down the stretch and heading into the first turn. Velazquez kept her off the rail in the 2 path to avoid the lagoon that had formed in the sloppy main track’s inside. By the time she straightened onto the back stretch, Wonder Gadot had pulled away from Cooler Mike enough to enjoy a comfortable lead through opening splits of :23.65, :48.03, and 1:12.96. Though Aheadbyacentury began mounting a sharp rally from the rear heading into the far turn and drew nearer, Velazquez remained chilly aboard his steed. With a final furlong to go, Velazquez gave Wonder Gadot a single crack with his crop, and that was all she needed. The Mark Casse trainee drew off convincingly to win the 9 1/2-furlong event by 5 3/4 widening lengths in a final time of 1:58.71. Just as they had done in last month’s $1 million Queen’s Plate Stakes at Woodbine, Aheadbyacentury and Cooler Mike crossed in second and third behind Wonder Gadot. Eskiminzin veered out sharply from the gate and was never really a factor from there, but he did outlast Absolution and Home Base in the end to complete the order of finish. Wonder Gadot’s win was her second straight and pushes her one step closer to completing the Canadian Triple Crown, which culminates in the $400,000 Breeders’ Stakes over the Woodbine turf course on August 18. That surface is not unfamiliar to the 3-year-old daughter of Medaglia d’Oro, whose overall record now stands at 13-5-4-3 with a lifetime bankroll of $1,381,261. Her first two career starts came over the Toronto course’s lawn, breaking her maiden on August 26 before finishing a close third in the Grade 1 Natalma Stakes one month later. Wonder Gadot returned $2.80 to win and $2.10 to place, while Aheadbyacentury paid $2.70 to place. There was no show betting.